By selling the stamps at a price higher than their face value there would be a margin of profit, which would go to the Committee. The scheme yielded no less than 50.000 guilders, an amount which surpassed all expectations. Judging from the receipts during the few months just prior to and immediately after the Games a huge number of stamps must have been bought by the public in a comparatively short time. Many of these probably found their way to collectors abroad. The Post Office on the Stadium grounds even instituted a separate selling organisation which issued forms with a full set of Olympic postage stamps cancelled with the Stadium stamp, and an explanation in Esperanto. This evidently proved most attractive, for about 9000 of these forms were sold. An illustration shows the form with the special Stadium stamp which was used by the post office officials to cancel letters, etc. posted at the Stadium Post Office. For the benefit of those who required a fairly large number of the Olympic stamps, but had no wish to wait in the long queues which formed up at the counters in those days, the authorities circulated order forms, on which anyone desirous of purchasing postage stamps could state what was required. The stamps ordered were in due course delivered to the person or firm in question after the necessary terms of payment were or had been complied with. 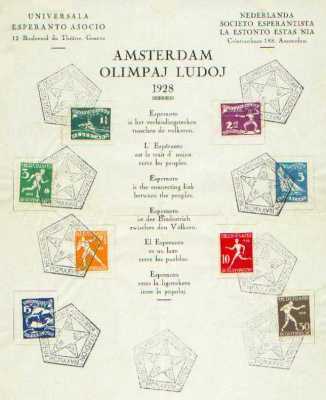 A most valuable means of propaganda, for which the Committee is extremely indebted to the Post Office Authorities, was the cancelling stamp with an announcement of the Olympic Games at Amsterdam. This stamp was used on all mails leaving Amsterdam during the three months, April—June 1928, and as the letters, postcards, etc. bearing the announcement were automatically distributed throughout the world it was an important item especially inour foreign propaganda campaign.This cooperation on the part of the Postmaster General was highly appreciated by the Committee. months prior to the Games.